•	Customers can sign up for the free newsletter program published by HairFinity and begin using the instant coupon codes, savings offers, and other discounts they receive through email campaigns immediately after they start to receive them. Most deals are shipped out on a weekly basis, but other surprise offers are going to pop up regularly from time to time as well. •	Customers looking for exclusive savings opportunities will want to follow crack around social media. Coupon codes and discounts are advertised on a surprise basis on their Instagram and Twitter accounts. •	Reward points can be limited with every purchase made on the HairFinity site and applied to future orders. Hairfinity offers a range of health and care products for hair and more. Hair vitamins are featured on the site, including 1-month, 2-month-, 3-month, and 4-month supplies of Hairfinity Healthy Hair Vitamins. Six-month and 12-month supply packs are also available. Hair care products includes the Ultimate Revival Kit, the Deep Repairing Kit, and the Cleanse and Condition Kit. Specific products include the Hairfinity Gentle Cleanse Shampoo, the Hairfinity Balanced Moisture Conditioner, and the Hairfinity Nourishing Botanical Oil. Skin vitamins are available, in addition to hair analysis tests, hair measurement shirts, and products from the Silk Sleep Essentials line. Autoship options are also available. 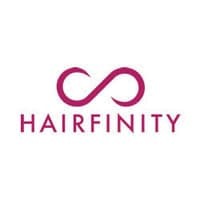 For most up to date offers check out Hairfinity on Facebook and Twitter or contact Hairfinity Support for any questions.